A special gift for that special someone, this charming jewelry set completes any outfit with lustrous luxury. Featuring exquisite freshwater pearls, the necklace, braclet, and stud earrings exude elegant style. The leatherette box offers sophisticated storage for the pieces. The necklace, bracelet and earrings are beautiful, and the heart-shaped clasp is adorable. The presentation box is very study and nice looking. I am somewhat disappointed, though, because they are not knotted between each pearl. The close-up picture looks like it has knots. Had I known that the pearls were not knotted, I would have made a different selection. This is why I gave it three stars rather than five. I'll keep this set, though, as it is a present for my daughter as she graduates from high school, and she won't care about the knots. This was given as a Mother's Day gift. I gave this to my mother as a Mother's Day gift. When she came to visit, she brought this 3-piece set with her. It was so lovely! She absolutely loved it. This was her first set of pearls and they were perfect for her. The box was also very pretty. She really liked it. 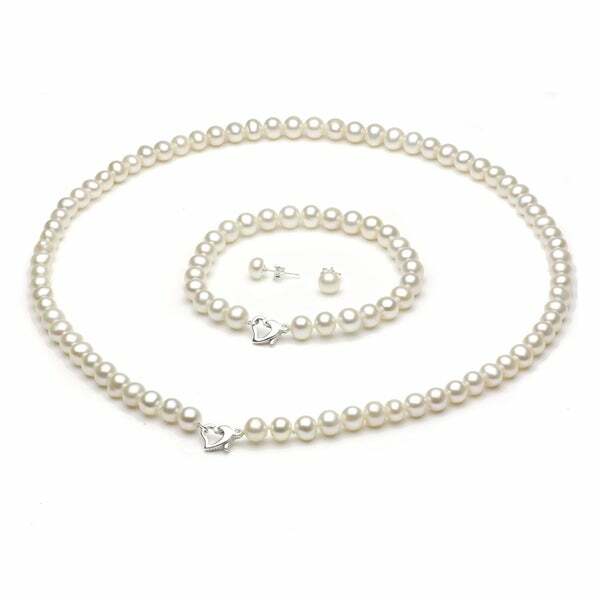 We purchased this freshwater pearl necklace, bracelet and earring set for bridesmaid's gifts for my daughter's wedding. The came in a gift box and looked amazing! This pearl jewelry set is more beautiful than I had anticipated and it was well worth the price. I gave this as a graduation gift for my granddaughter who was very pleased. I noticed that the pearls were not individually tied, which I would have preferred otherwise, but the box was nice and the clasps were very good. I would definitely recommend this especially considering the price. I purchased this set as a Christmas gift for my sister. When it arrived I was thrilled with the quality of the pearls and the size was perfect, also the sterling silver heart clasp is adorable. This set is truly elegant. And it arrived in a beautiful jewelery box. I was proud to give this as a gift, and I just might have to buy myself this set that's how much I loved it! I bought this pearl necklace and earring set for my daughter who had been borrowing my pearls to wear quite a bit. The set came well packaged, and they are very pretty. You can’t beat the price to get something that looks as good as these did. My daughter has had the pearl set for several months with average wear, and they have held up well. This would be a great gift for a someone to give. They look like WAY expensive pearls! These are fantastic!! Not each pearl is exactly symmetrical, and that's what makes them so beautiful and unique (and not fake looking). The heart clasps add a wonderful finishing touch that looks closer to white gold than the sterling silver that it is! My girlfriend was blown away by these as her Christmas gift (as many other O.com gifts have). This set is an easy to go to accessory for simple elegance. Unfortunately, the necklace is a little longer than what I wanted, but everything else in the set fits perfect. I really love the clasp on these. Its a silver heart. So lovely. She loved it! I only would provide a better box as it was burgundy vinyl. But the product itself was very good quality. I used to work in jewelry store. I was very pleased and would order again. Bought it for my daughter on her 1st Communion...She looked lovely and elegant wearing this! Gave this as a high school graduation gift. It is simply lovely and totally appropriate for a high school graduate. It is a beautiful set that I would recommend to anyone. I would recommend this pearl set for anyone looking to impress their significant other. Amazing quality and truly gorgeous. Classic look! i like this set. Beautiful piece. I was a little disappointed in the size of the bracelet and concerned it wont fit my wife's wrist. It looks like it's made for a small child. Other than the bracelet my only other disappointment was quality of the box it came in. I bought this as a Christmas gift for my daughter. She needed something pearl to wear for a sorority Christmas party. This was of very nice quality especially for the price. got it for my wife for Christmas great gift. Gorgeous! Loved it! Will be a gift for sure! I bought it for a graduation gift. I was comparing it with another item from Macys, but this item's review stated the clasp is strong and the quality of the product is really good. I will make my final review when I receive my item. purchase for second graduating granddaughter. "Is there a way that I could get the necklace in a shorter length or an adjustable length like 16''-18''?" Hello loganpwns, Unfortunately no, this comes only as show. Please let us know if you have any further question. Thanks for shopping with us.